Download "Convoy Application For Motor Oil Limited Warranty"
2 Convoy Motor Oil Limited Warranty For Vehicle Engines Granted By The Conklin Company Inc. The Conklin Company is proud to offer to you the following warranty. We agree to repair or replace at our expense any of the vehicle engine parts listed below that fail or experience abnormal wear due to lubrication failure resulting from defective Convoy if all of the terms of this warranty have been met. This warranty begins at the expiration of the manufacturer s warranty and continues for as long as you own the vehicle. COVERED ENGINE PARTS: Piston and rings Crankshaft and bearings Timing chain Rocker arms and pivots Timing gear and/or sprockets Wrist pins and bushings Rods and rod bearings Oil pump Camshafts and bearings Valve lifters Distributor drive gear Block Valve stem and guides (grinding and adjustments excluded) A. THIS WARRANTY IS SUBJECT TO THE FOLLOWING CONDITIONS AND EXCLUSIONS: 1. It does not cover vehicles modified for competition. 2. A separate warranty must be completed for each vehicle. 3. We reserve the right to reject any claims that result from normal wear to engine parts. 4. We reserve the right to reject any claims which are the result of collision, abuse, negligence, defect in manufacture or improper installation of any part. 5. This warranty will not cover any damage resulting from failure in keeping the motor oil, automatic transmission fluids and engine coolant at the prescribed levels of the manufacturer or maintaining the air cleaner or the emission control system in accordance with the manufacturer s recommendation. 6. Any listed engine part can be replaced or repaired only one time under this warranty. B. PROCEDURE TO FOLLOW IN ORDER TO OBTAIN COVERAGE UNDER THIS WARRANTY: 1. 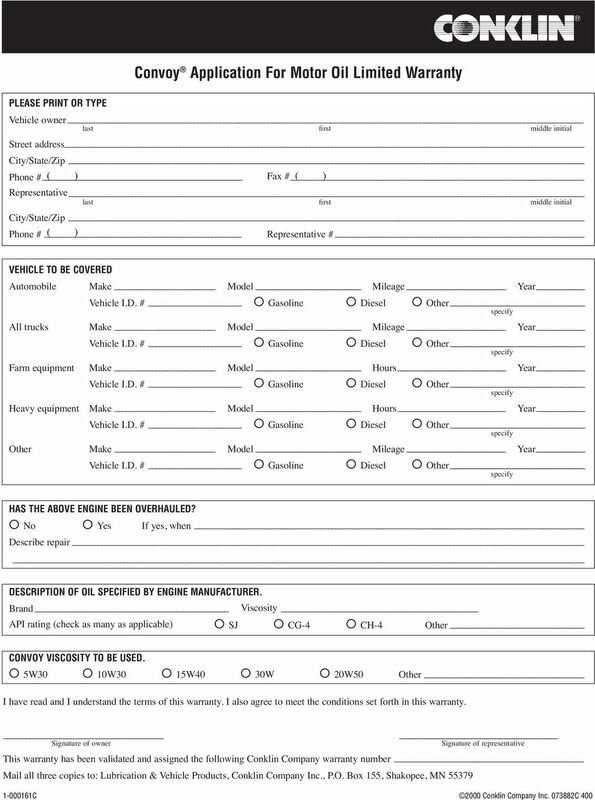 Send to the Conklin Company all copies of the completed and executed warranty application. The mailing address is Conklin Company Inc., Lubrication & Vehicle Products, P.O. Box 155, Shakopee, MN For cars, vans and pickups which have been used for more than 12,000 miles, farm equipment which has been used more than 500 hours, over the road tractors with more than 25,000 miles, and heavy equipment with more than 250 hours, send a used oil analysis (UOA) report sheet along with your warranty application. We reserve the right to deny coverage under this warranty based on the findings of the UOA report. If coverage is denied, you will be informed within 30 days of our receipt of the UOA report and your application. The UOA will be at your expense. C. TO KEEP THIS WARRANTY VALID, YOU MUST COMPLY WITH ALL OF THE FOLLOWING REQUIREMENTS: 1. The engine is to be serviced with Conklin s Convoy motor oil exclusively. 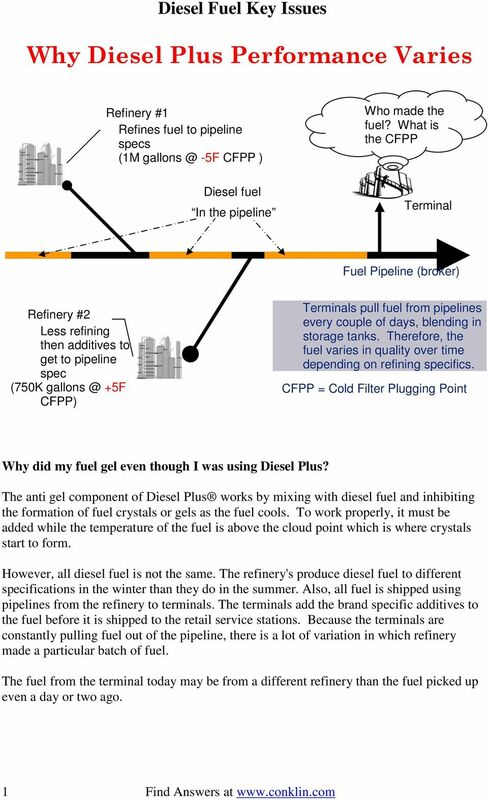 Check your owner s manual for proper API and SAE service recommendations. 2. No engine oil additives can be used while this warranty is in effect. 3. 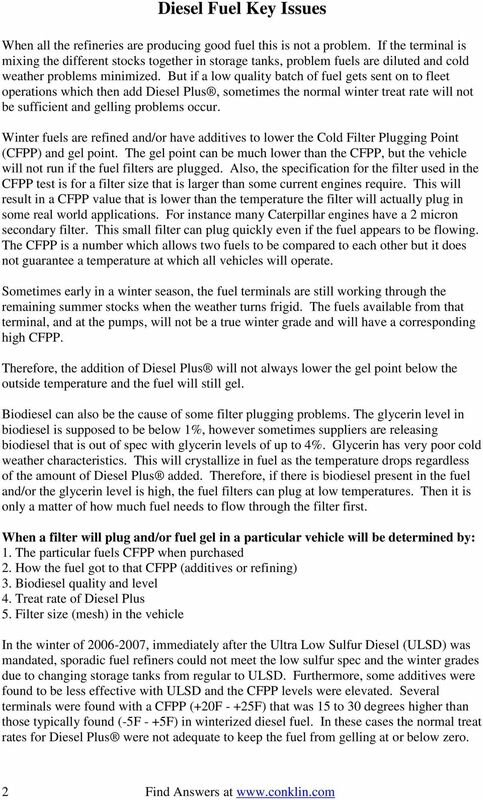 Even though Convoy is an extended drain motor oil, certain maintenance guidelines must be followed: a. Oil filters must be changed according to manufacturer s recommendations. b. If you use your vehicle for severe service (e.g., short trips engine not thoroughly warmed up, extensive idling, pulling a trailer, or driving in dusty conditions), Convoy must be changed at 7,500 miles or six months, whichever comes first. Refer to your owner s manual for specific severe service maintenance instructions. c. If your equipment has a capacity of 10 quarts or more, your drain interval should be determined by UOA. d. If your equipment runs under extra severe service, (e.g., police cars, school buses, delivery trucks, etc. 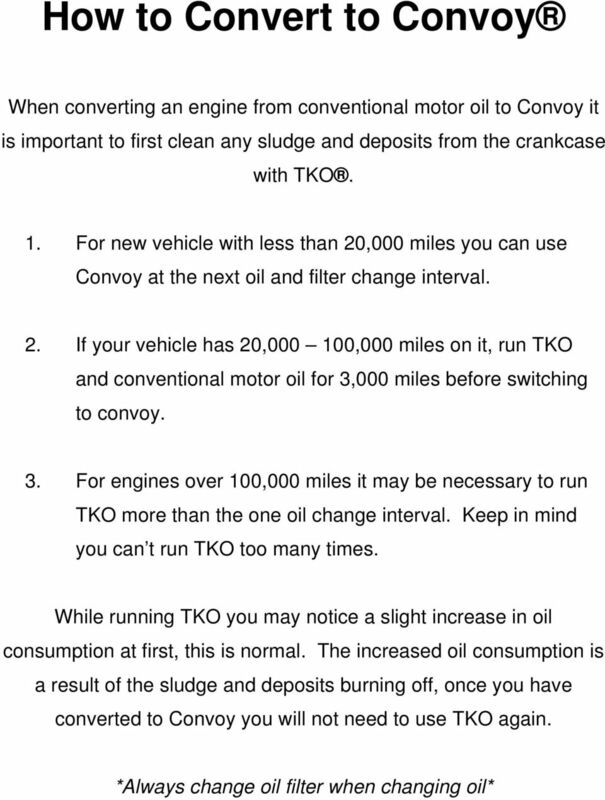 ), Convoy must be changed every 4,000 miles. 4. In the event of a claim, you must submit to us before any work is done documentation that Convoy was being used and the maintenance requirements of Section A.5. and C.3. have been met along with a UOA. Also, all oil in your engine at time of failure and all failed parts must be retained and submitted to us upon request. D. PROCEDURE TO FOLLOW IN THE EVENT OF A CLAIM UNDER THE WARRANTY: 1. 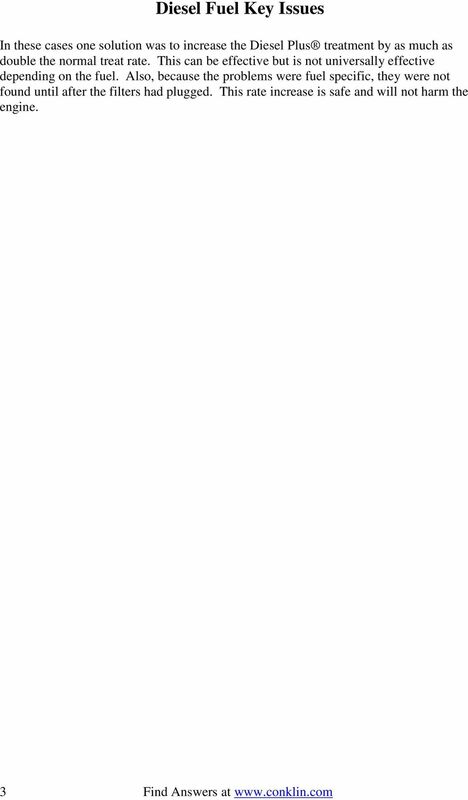 You must notify the Conklin Company in writing of the claim along with the materials required by section C.3. Please send this to Conklin Company Inc., Lubrication & Vehicle Products, P.O. Box 155, Shakopee, MN You must include with your claim a statement of the exact damage and the estimated cost of repair. Conklin reserves the right to request a second estimate. 2. Our representative will contact you within ten working days of receipt of the claim. 3. 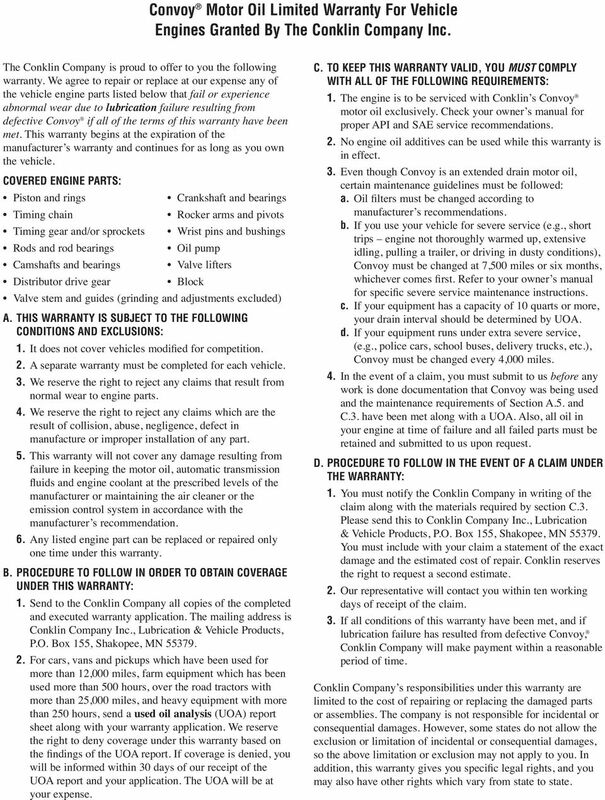 If all conditions of this warranty have been met, and if lubrication failure has resulted from defective Convoy, Conklin Company will make payment within a reasonable period of time. Conklin Company s responsibilities under this warranty are limited to the cost of repairing or replacing the damaged parts or assemblies. The company is not responsible for incidental or consequential damages. However, some states do not allow the exclusion or limitation of incidental or consequential damages, so the above limitation or exclusion may not apply to you. In addition, this warranty gives you specific legal rights, and you may also have other rights which vary from state to state. Couch Oil Company Quality Assurance Fuel Program Featuring Premium 2000 Diesel Fuel Improver Diesel Fuel Is Often A Company s Largest Expense. Unfortunately, There Is Very Little Control Over Its Quality. TAKE TO THE ROAD WITH CONFIDENCE New Maintenance Products for 2007 Cat Engines and Beyond ADVANCED ENGINE Hit the highway with a new Cat engine, and you can be sure you re meeting today s emissions regulations. Donaldson Delivers Full-Flow Lube Filters for Cummins ISX Engines. Cummins is a registered trademark of Cummins Inc.
Fleet management technology is changing the way fleet managers look at vehicle fuel consumption. Every fleet, big or small, must pay for fuel. The challenge is to consume it in the most effective way possible. Does Brand Matter for Motor Oil?